Disneyland Paris is slated to host "Magical Pride" to celebrate the LGBTQ community. People will have to take a trip overseas to join the official event, however. PARIS, France — People are welcomed to come as they are to one of Disney's international parks for a special celebration. For the first time, Disney is inviting guests to a pride event to celebrate the LGBTQ community. 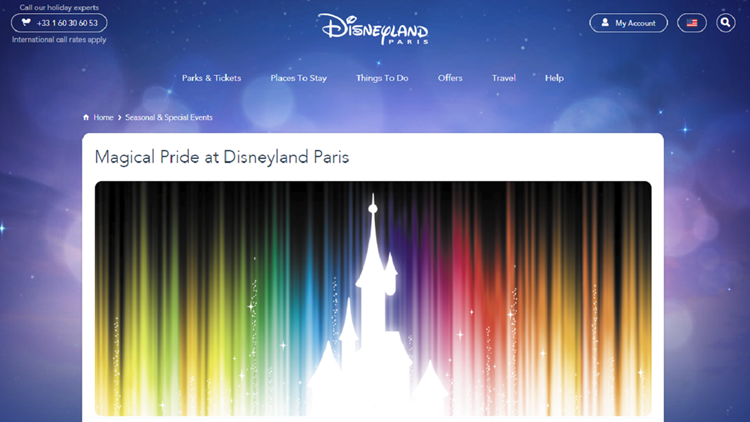 Disneyland Paris is scheduled to host "Magical Pride" on June 1, according to the company's website, the start of Pride Month. "Dress like a dream, feel fabulous and experience Walt Disney Studios Park like never before - loud, proud and alive with all the colours of the rainbow," Disney says. The event will feature a parade, Disney characters interacting with guests and the chance to hop on some rides late into the night at Walt Disney Studios Park.